Why the Iran deal is good for U.S.
Editor’s note: Laicie Heeley is the director of Middle East and defense policy at The Center for Arms Control and Non-proliferation. The views expressed are the writer’s own. Two weeks after the P5+1 powers reached a deal aimed at curbing Iran’s nuclear program in return for some sanctions relief, the American public is still trying to make sense of the deal. Multiple polls, including from Washington Post/ABC and Reuters/Ipsos indicate strong American support for the deal with Iran. Yet a new Pew Research poll suggests many Americans are skeptical about Iran’s intentions, with a plurality disapproving of the agreement. Given that the agreement is so complex, it’s understandable that the U.S. public is making up its mind about the deal. But the reality is that after decades of disappointment, the United States is finally approaching a win with Iran. This is a good deal for the United States and its allies. The details of the accord, reached in Geneva by the United States, Britain, China, France, Germany and Russia, square firmly within America’s national security and non-proliferation interests by freezing the progress of Iran’s nuclear program before it reaches critical weapons capacity, while also initiating a rollback of the most sensitive parts of Iran’s nuclear program. That’s a boost for both U.S. and international security. Leading national security experts from across the ideological spectrum agree, including former National Security Advisers Brent Scowcroft and Zbigniew Brzezinski, and former Secretary of State Madeleine Albright, who have found common cause in championing the possibilities an accord presents. The deal will halt enrichment of uranium at 20 percent levels and requires the existing stock of 20 percent material be converted to an oxide form – a process that effectively eliminates the threat of that uranium being further spun into weapons-grade material. Under the agreement, Iran also will suspend the operation of additional centrifuges and permit the most expansive transparency measures in International Atomic Energy Agency history. In return, this agreement presents no risk to the United States. For suspending those activities for 6 months as part of the first phase of a two-part deal, Iran will receive $6 billion to $7 billion in sanctions relief. However, the main structure of the sanctions regime remains intact and will continue to cause damage to the Iranian economy as those sanctions that have really hurt – the oil, banking, and financial services sanctions – will stay in place. Is this a perfect deal? No, it’s not ideal for either side. The U.S. chose not to fight for a complete dismantling of Iran’s nuclear program, and the sanctions relief Iran chose to accept is relatively minor. But, it is a good first step, and it is important to recognize that this agreement has the support of the international community. A deal that expected capitulation on every point would be as unreasonable and unrealistic. And nor should the United States have attempted to extract concessions that would only build into resentment that encouraged later cheating. Any deal that undercut Iran’s sense of pride would have simply empowered hardliners at the expense of pragmatic leaders inside the Islamic Republic. America’s best diplomats, along with the help of the international community, have worked for years to establish the incentives to achieve this good deal. They deserve our thanks. Now the United States and our allies are freezing the most proliferation-sensitive aspects of Iran’s nuclear program, beginning a modest rollback of its capability, and establishing the outlines of a long-term deal that will permanently eliminate the threat of a nuclear-armed Iran. That’s a big step forward and one that all Americans should support. Please read my thoughts (unconnected to the above) on : 'A new World Order ! I wish to pass on just a fleeting thought, which seems difficult to deny. (by the way you’re doing, okay aren’t you ? – There’s always progress when you’ve acquired more insight ! ). is indeed on the rise, but.......this only takes place at the expense of, not only the lower classes, but even the middle classes: they too are beginning to get poorer ! When you predict the future, starting from this ‘fact’, we will only be facing social revolutions (wars within countries). I don’t think this just a ‘wild’ guess, it will – and here and there – it already is fermenting. I have no idea how this will pan out, but will we be completely powerless to reverse this trend ? The future is not so –socially – liveable, as we try to believe. Most certainly, it will be the culturally strongest societies, who will have to develop a solution. – and I am an optimist by nature ! So, what does all this have to do with the subject at hand? It may good for the rest of the country, but I don't like it a bit as it may prevent another war from breaking out in the Middle East. We need to put all our money in defense and fight them there wars, I say!!!!!! And we'll put Colonel Foghorn Leghorn in command. Iran's current President, Hassan Rouhani, has stated and I quote, "The Beautiful Cry of Death to America Unites our Nation." During his campaign earlier this year, he has repeatedly said and again I quote, "Saying Death to America is easy, we need to express Death to America with action." Those were his exact words in an effort to get elected; however, I do not believe for one second all of a sudden he has changed his mind. Was he lying to the Iranian people to get elected or telling the truth. I feel that is how he feels about America; he's a politician, need I say more. He is lying and has an ulterior motive. The current speaker of the Iranian Parliament, Ali Larijani, has also voiced a hatred for the United States. He stated these exact words, "The time has come for the disappearance of the West from the Universe." Several other leaders in the Iranian government has expressed similar statements. The current leader of Hezbollah, a terrorist organization armed and supported by Iran recently stated, "Our hostility to The Great Satan America is Absolute, Death to America." He further stated, Israel and America are the foremost enemy of Islam. The former President of Iran stated Israel must be wiped off the map. Iran is a country that has two current leaders that state, "We need to kill the Non Muslims and put them to the sword." Iran is a country where anti-American demonstrations are the norm. You don't understand the problem. When the U.S. threatens to "strike" Iran and Obama repeats the idiotic Bush statement, "All options are on the table," besides Iran being labeled as a member of the "Axis of Evil," do you expect love from Iranians? Let Obama stop threatening Iran and maybe Iranians will stop shouting "Death to America." Besides, their cries are not threats. They are emotional outbursts. In contrast, the American statements are explicit threats. Regarding US politics, it is a GOP cornerstone that humanity progresses through freedom and not by restriction. Restriction can correct, but diminishing returns will always break the chains. Gee Jal, do I detect a case of "affluenza" on your part? The Republicans seem to be deeply afflicted with it! No wonder there is so much corruption and war fever in Washington with all this "affluenza" going around! This is what the DOD thrives on! I see you picked up on that concocted word used in that story of the teenage DUI killer. And your continuous use of it indicates you were impressed. Reblogged this on Fondling the Truth. The Problem is that Americans including the Author think that Mullahs’ regime is a rational, pragmatic regime like any other in the world, while the fact of the matter it is not. The theocratic regime’s officials and decision makers have deeply rooted apocalyptic beliefs. Underestimating this radical ideology even as the Iranian regime is on its way to building a nuclear bomb can lead to dangerously wrong conclusions. The suggestion taking hold of late that a nuclear armed Iran is not the end of the world may unfortunately be dead wrong. The Mullahs' regime in Iran prepare for the return of Islamic Messiah as they slay infidels. They are asserting that Armageddon is at hand and that the Islamic regime's followers, indeed all of Islam, must prepare for a monumental change in the world, their claim awaits until they get the nuke bomb. Don't be fooled by the Mullahs' charm offensive campaign. You are yet another misguided Iranian, perhaps. In the first place, Iran is not a theocracy since the Shiite version of Islam has not hierarchy. Secondly, even the top American and Israeli general have stated that Iranian leaders as "extremely rational." Check it out if you don't believe me. Thirdly, it is not the "Mullahs" who make decisions in Iran. Iran is the most stable and democratic country in the Middle East. Even Israel is a racist and apartheid theocracy. The rest of the countries mostly don't even have elections or even a parliament. So, go back to your hole and stop talking nonsense. Indeed this interim deal is the best scenario for the moment. Another alternative would only lead to escalations of the crisis, which could spin out of control and it would take decades to mend fences. Yes, Iran is keen on having sanctions lifted and willing to cooperate. We should grab the opportunity, or else it would be difficult, if the negotiations took a sour turn. Well put, j. von hettlingen. By the way, did you hear about that case in Fort Worth, Texas where a 16 year old boy got ten years probation plus a year in a posh rehab center in Newport Beach, California after he stole two cases of beer, got quite drunk and then ran over four people, killing them outright? I guess not probably because the news of this ignominious case never reached Europe. 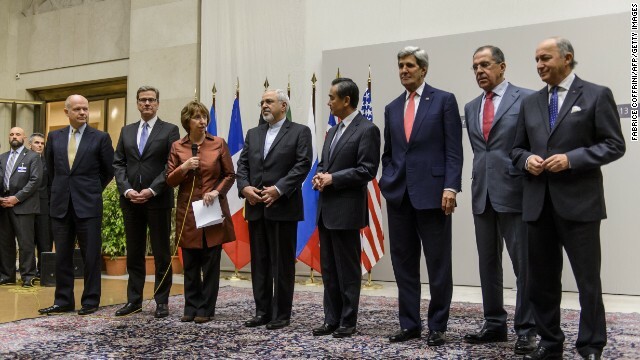 The sanctions were designed to bring Iran to the negotiating table. Iran is negotiating. Don't screw it up, Congress. @banasy, what if we were to compare Iranian to Cuban sanctions ? Is there any common ground when it comes to the design and the overall intended result? You are mistaken. Iran is not negotiating because of sanctions. Iran has always been ready to negotiate. There is negotiation now because Obama finally understood that sanctions have absolutely no effect on Iran's nuclear program and decided to negotiate with Iran. MIRA NO TE VAS A QUEJAR POR QUE LAS PERRAS NEGRAS NORTE AMERICANAS SUPUESTAMENTE SON ARRECHAS Y PELEONAS. ANDA A CHUPARTE TU PENE DE HEROINA. NSA MIRAR COJE PUTAS NORTE AMERICANAS NOSOTROS ORDENAR A LA PUTA ESPOSA DE CLINTO LLAMAR PARA CERRAR LOS SATELITES. NO ROTAR TANTO LOS IPs DE NANO PARTICULAS POR QUE LOS HAKEAN SATELITES CHINOS CUADRADOS CON EL REY DE ESPAÑA Y CHINA. PAGA NUESTRO DINERO PEDASO DE NARCOTRAFICANTE. IMPETIGA NO TE GUSTA QUE TE DIGAN REPTILITA PUTA. ATREVETE A HABLAR MARICO DEL ARIA51 YA SABES PARA DONDE VAS TE ACUERDAS DE FEMA. SFGDSFGSDFGSDFGNSA MIRAR COJE PUTAS NORTE AMERICANAS NOSOTROS ORDENAR A LA PUTA ESPOSA DE CLINTO LLAMAR PARA CERRAR LOS SATELITES. ESTA ES LA TAREA CNN. I'm totally in favor with this deal with Iran. It appears that this new mental disease called "affluenza" is going around and turning our lawmakers into warmongering, right-wing fanatics on Capitol Hill. This disease will be the cancer that will slowly be killing this country. Anyone who's been following the news out of Fort Worth, Texas will know what I'm talking about. This "affluenza" is a current threat to our upcoming treaty with the Iranians! Why isn't anyone talking about the faltering dollar here? Iran will accept dollar for oil after the deal. Demand for dollar goes up and we will prosper plus $250 million a day as geopolitical premium discount in oil price. It pays for a lot of subsidies we need to make to help Israel. Don't worry, Congress just tripled the new extra-special aid the dumb Obama administration asked for Israel. Israel will get aid from us even if we are all starving.